An American university has chosen Bermuda as its domicile for the first known student-run captive insurance company. Students enrolled in the Davey Risk Management & Insurance Program at Butler University’s Lacy School of Business in Indianapolis, Indiana, were granted licensing approval from the Bermuda Monetary Authority [BMA] this month to launch the captive, which will self-insure a variety of risks for the university, including its celebrity mascot, a bulldog, and its fine art collection. MJ Student-Run Insurance Company Ltd, will formally open for business this August, and is believed to be the first of its kind in the world, the BDA said. “We’re the first university I know of to have a student-run captive,” said Zach Finn, Clinical Professor and Director of the four-year programme he helped launch in 2012. 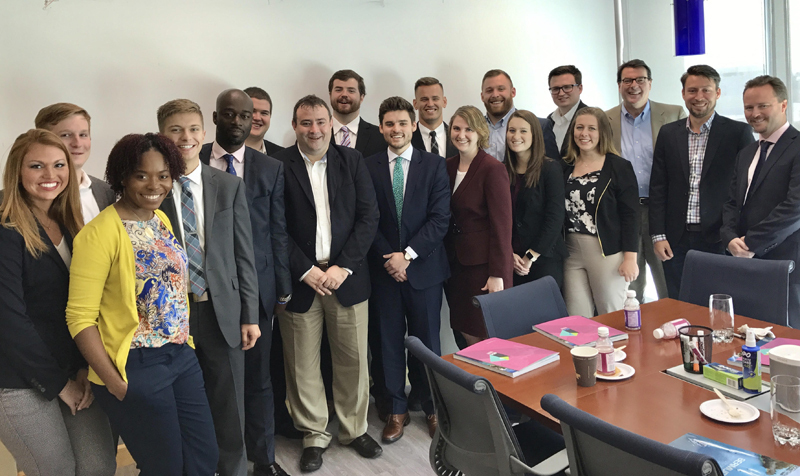 Butler students and faculty received the news from the BMA this month during a five-day visit to the island in which they also met with members of industry and the Bermuda Business Development Agency [BDA]. “Butler’s recognition reaffirms the fact of Bermuda’s top-tier qualities; its independent analysis validates what many in the risk solutions industry have long determined,” said BDA CEO Ross Webber. Students also met with service providers Aon, KPMG and Conyers law firm, companies they had selected to work with to create, launch and manage the captive. “It has been a privilege to partner with Butler University and assist with the formation and management of what is believed to be the first US student-led insurance company,” said Anup Seth, Managing Director of Aon Insurance Managers Bermuda. The project took shape at Butler last year when Professor Finn, who previously worked as a risk manager and risk analyst, assigned students an objective comparison of insurance domiciles both in the United States and overseas. Two groups of students each were assigned five competing markets for which they conducted analyses on capitalisation, premium and excise taxes, and other standard comparisons. Finn then asked them to contact the regulators of each domicile to check responsiveness. “Bermuda and Vermont were the only two domiciles that got back to us—within four hours,” he said. “The opportunity to have our students come down here and interface with a large swath of the global reinsurance market is unbelievably powerful,” said Finn, whose team then worked with Conyers to set up the captive as a legal entity, did an RFP for a captive manager, selecting Aon, and worked with KPMG to develop five-year pro-forma financial statements. The Bermuda captive will insure the school’s mascot, celebrity English bulldog Butler Blue III, nicknamed Trip, which has over 20,000 Twitter followers, as well as Butler’s bomb-sniffing dog, Marcus. It will also cover all other student-run start-ups at the university and Butler’s fine-art collection. “This was the coolest project I have been a part of in my four years at Butler,” said Brad Weber, 22, who, after graduating next month begins his first job—as a risk analyst with a manufacturing multinational serving the aerospace industry. Outside the Box thinking. That is what separates the great from the good.